Throw away those ADSL microfilters! If you're looking for a really cost-effective way to substantially increase your broadband speeds, then an ADSL faceplate (also known as a filtered faceplate) is it! It's a real shame that so many broadband users are unaware of what an ADSL faceplate is, how easy it is to install, and the substantial impact it can have on broadband speeds. It really is a 'must have'. Say goodbye to conventional ADSL filtering! Along the telephone cable from the BT exchange to your property, the digital broadband signal travels alongside the voice telephony signal. In your property, filtering has to take place to separate them. In the vast majority of broadband homes today, filtering takes place in a certain (non-optimum) way. When their broadband service is first connected, most broadband users receive a number of microfilters along with their broadband router/modem. They are instructed to plug the microfilters into every telephone extension socket in the property. As well as the microfilters looking visually unappealing, there is always a risk that a particular extension (for example, for a Sky Digibox) gets overlooked. Once the microfilters have all been plugged in, a broadband user can connect his or her modem to the BT NTE5 mastersocket, through a microfilter. Unbeknown to most users, this conventional approach can result in substantially lower connection speeds than the line is actually capable of. This is because the extension wiring throughout the property is not isolated from broadband signal and can, therefore, interfere with it. What is an ADSL faceplate and what does it do? An ADSL faceplate (also known as a 'filtered faceplate') is designed to replace the faceplate on the BT NTE5 mastersocket. An ADSL faceplate replaces the need for microfilters on all telephone extensions by filtering the broadband signal directly at the BT mastersocket, so that the broadband signal is isolated from all extension cabling throughout the property. BT fully supports the use of ADSL faceplates and in no way will the use of a filtered faceplate contravene BT regulations with regard to the NTE5 mastersocket. 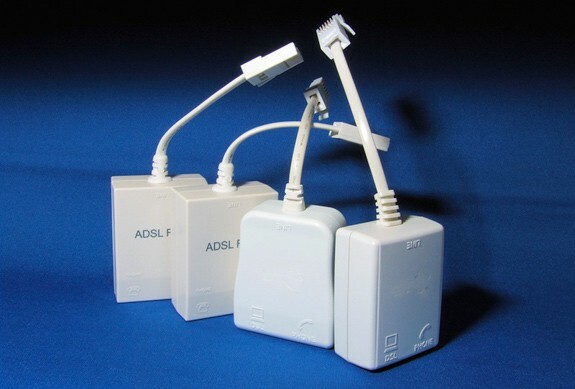 In most cases, an ADSL faceplate dramatically reduces the amount of the interference suffered by the broadband signal compared with conventional ADSL filtering (described above). This results in substantially increased broadband speeds and a more reliable connection. For households suffering from relatively low broadband connection speeds (say 1-2 Mbps), a filtered faceplate often doubles the connection speed. For some households where there is a large distance between the property and the BT exchange, the presence of a filtered faceplate can make the difference between receiving an acceptable broadband services and not being able to receive a broadband service at all. An ADSL faceplate is an extremely cost-effective way of increasing broadband speed, and high-quality filtered faceplates can cost less than £10! If you wish to purchase a high-quality faceplate, please consider purchasing the Solwise faceplate that we have selected through Amazon. We will earn a small commission, which will help contribute towards the costs of running this broadband information site, to help you and others. Thank you for your support! An ADSL faceplate is very easy to install. First, ensure that you have an BT NTE5 mastersocket, which looks like the photo on the left. It will have a small BT logo in top left hand part of the mastersocket. If you have an older property, there is a risk that you will not have an NTE5 mastersocket (which will prevent you using a filtered faceplate). You can request BT to install an NTE5 socket, although you may be charged for this. 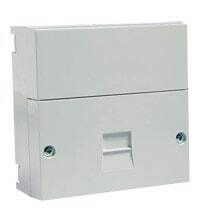 Alternatively, if you would prefer to save money and do it yourself, you could install an NTE5-style box right next to your the BT mastersocket that you have been provided by BT, by connecting a new NTE5 mastersocket as an extension to BT's mastersocket. Then you need to disconnect your extension wiring from the original mastersocket and reconnect it to your new NTE5 'extension' box. When you have located the BT NTE5 mastersocket in your property, unscrew the original faceplate (which is the front bottom part, as shown in the photograph). Replace this faceplate with the filter faceplate that you have purchased. If you have extension wiring in your house, you will need to detach the wires connected to the old faceplate and reattach them to the new filtered faceplate. Your faceplate should come with full instructions. Then push the new ADSL faceplate into position and use the existing screws to keep it in position. All done! You can now connect your modem directly to the modem socket using a short modem cable, and you should experience a significant increase in downlink connection speed. We advise you to place your modem very close to your NTE5 mastersocket, and use as short a modem cable as you can. Please do not use a long extension cable. How to work out if an ADSL faceplate will work for you! Locate your BT NTE5 mastersocket in your property. Measure the downlink connection speed of your broadband service. You will find instructions on how to access your modem stats in your modem documentation. Please note that this number is NOT the actual downlink throughput as measured by an online speed test. Disconnect the modem from the BT NTE5 mastersocket (or the telephone socket you are using). Unscrew the bottom faceplate and pull it out, taking care not to remove any extension cables connected to it. Please note that this will temporarily disconnect any phones you have connected to extension sockets in your property while you carry out this test. Removing the faceplate will reveal a hidden phone socket, which is known as the ‘test socket’. Plug a microfilter into the test socket and connect your modem to this microfilter. Reconnect your broadband service and record the new downlink connection speed. If you see an improvement in downlink connection speed, then a filtered faceplate will help you and you can buy a filtered faceplate for a great price from Amazon here. Please note that, to compare the performance before and after, you must measure the downlink connection speed, rather than using an online speeds test (which will tell you your downlink throughput). This is because BT will not increase the bRAS profile (setting throughput) until the connection has been up for a significant period of time (which can be three days or more) as explained in our Increase Broadband Speed Guide. So, you may be lulled into believing that this had made no difference whereas it may have had a big impact. Is an ADSL faceplate the same as the BT I-Plate? Particularly if you read online forums, you may have heard of the BT I-Plate, which is now called the BT Broadband Accelerator. While this also attaches to the BT NTE5 mastersocket, it is not the same as a filtered faceplate, as explained in our BT I-Plate versus Filtered Faceplate page. An ADSL faceplate filters out the broadband signal from all of the extension wiring, not just the ring wire (as with the BT IPlate/Broadband Accelerator). This provides you with the absolute maximum possible performance as none of the wires in the extension wiring can interfere with the broadband signal. If you have an ADSL faceplate, there is absolutely no benefit from using the BT I-Plate instead. If you already use an BT I-Plate, there may be performance advantages from using a filtered faceplate. You cannot use a BT-I-Plate at the same time as a filtered faceplate as we understand that the filtered faceplate will not fit (and would give absolutely no performance advantage if it did). Your WiFi could be the bottleneck of your broadband connection. Read our WiFi Optimisation guide to ensure your Wifi is not the weakest link.